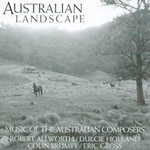 Australian landscape : music of the Australian composers. Concerto for flute and orchestra : piano reduction / by Colin Brumby. Instrumentation: Solo flute, piccolo, 2 flutes, 2 oboes, 2 clarinets in B flat, 2 bassoons, 2 horns in F, 2 trumpets in B flat, 3 trombones, timpani, percussion (1 player), harp, strings. 9 Mar 76: Brisbane City Hall. 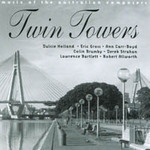 Featuring Adelaide Brown, Queensland Symphony Orchestra, Patrick Thomas.